When we talk about fashion, glamor comes to mind immediately, exaggerated consumerism guided by passing trends and vanity. The fashion is considered until nowadays something superficial and empty. However, in recent times, innovative ideas have emerged, one of them is “sustainable fashion” in the form of “slow fashion”. 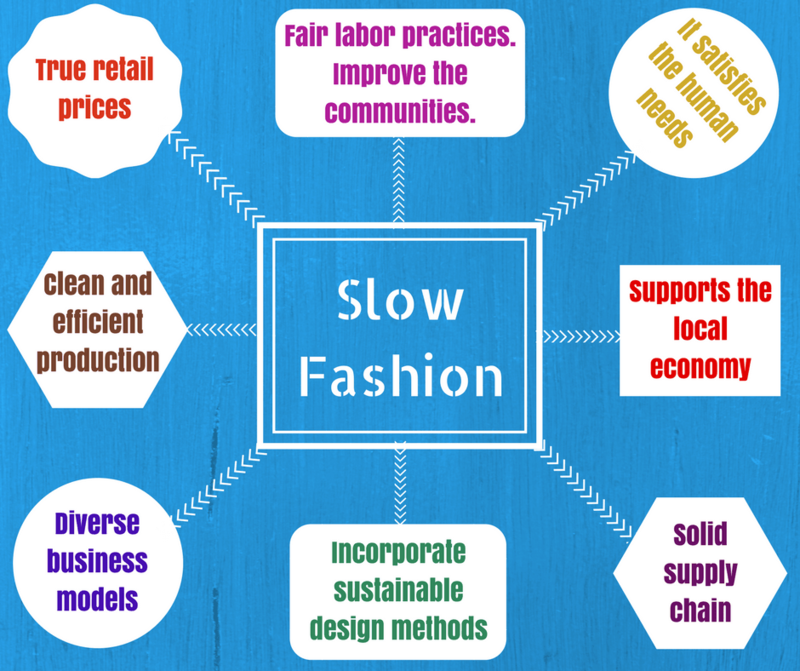 The term of Slow Fashion was born in response to fast fashion or industrialized fashion and fast consumption. We are talking about a movement that seeks to make the population aware of the damage that “fast fashion” is causing to the environment. 2.2 Blue, pink, yellow… green? 8 And if so… why are not we wearing sustainable clothing? The fashion industry does not occupy the second place as a polluting agent only because of the deplorable condition in which the garments are produced, but also because of the slow decomposition (some materials may take centuries), the high production of garbage, process of production of the fibers and the chemicals with which they are treated in the elaboration of the garments. This is followed by most detergents that contain chemicals that contribute to water pollution; likewise, when washing clothes, it releases micro fibers, which contributes to a lower water quality and the destruction of wildlife. In addition, softeners and fabric softener sheets are loaded with hazardous materials that are best avoided. The production of the most used fibers such as polyester (the most widely used fiber in the world) and rayon, produces a significant impact on the environment, requiring products such as petroleum and cellulose. Linked to large amounts of water and the incredible decomposition time. And if it is natural fibers such as cotton, we are talking about high levels of pollution, because it needs more than 5000 gallons of water in its production. In addition to being one of the most pesticides required. About 24% of all insecticides and 11% of pesticides. About 1 trillion fresh water is used every year in the dyeing process, this causes a tremendous impact on the environment and generates pressure on the decrease of fresh water sources. More than 100,000 synthetic chemicals are used in the fashion industry, and 70% of the waste produced goes into the water. Probably this tendency to use “disposable” clothes is the most damaging. The industry is designed to buy as much as possible in a minimum of time, by making people feel out of fashion in less than a week; the clothes are designed to be damaged in a short time; and the “discounts” are not really discounts. It seems that the slogan of the consumers is “Buy it, use it and throw it away quickly”. The consumerism of today and the desire to follow each “new fashion” is the main reason why the damage is multiplied. People are not thinking about what they need, but they are eager to buy everything they are presented with as long as it is the most trendy. So, is there nothing we can do? Let’s not be depressed, you can always do something. The sustainable has also reached the territory of fashion, presenting itself in the form of sustainable fashion or slow fashion. Sustainable fashion or slow fashion, is the antithesis to what is known as fast fashion or industrialized fashion. The term was first mentioned in 2007 by Kate Fletcher, professor of Sustainability, Design and Fashion at the Center for Sustainable Fashion in London. 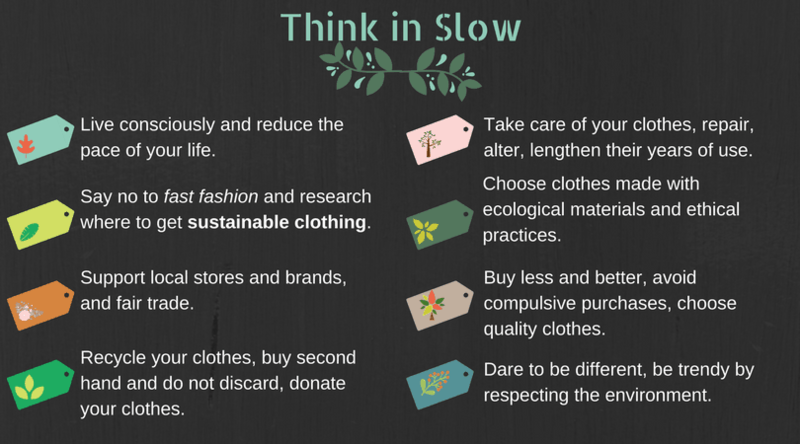 Slow fashion is not “the new trend of the season”, but rather a philosophy of responsible clothing consumption. The movement mentalizes and educates people about the impact of garments on the environment, the reduction of resources and the impact of the textile industry on society. Almost always, we use the terms “sustainable fashion” and “eco-fashion” to refer to the same thing (believe me, it’s a mistake I’ve made). I must clarify this, dear readers, if something is really sustainable, then it is eco-friendly; however, the same does not happen to the contrary. Not because something is ecological, it is sustainable. The same goes for the term “ethical fashion”. Let me illustrate an example: If a garment was made of 100% organic cotton in a neutral coal factory, but from a child victim of slavery, then the garment is ecological, but not sustainable. True sustainable fashion balances the rights of the workers with affordability to make ecological fashion. Therefore, it is necessary to find the balance between how it is done, with what, who did it and who can acquire it. Sustainable fashion is about balance. If you put more attention on one at the expense of the others, then you are not being sustainable. Our actions are linked to the environment. The goal is to minimize the impact. Reduction of consumption to promote a planned production with a rhythm adapted to the natural cycles. Innovative and diverse business models are encouraged, such as independent designers, cooperatives, vintage garments, recycled materials, rent and change of clothes. In addition to traditional methods and techniques of making and dyeing clothes and fabrics, creating original and unique models. It promotes fair trade, cooperatives and codes of conduct that can help establish fair labor conditions for industry professionals. They also emphasize support for local communities to develop professionally. More ethical processes of production and manufacturing. Designers can explain the story behind each piece and invite the consumer to be part of the process, promoting a closer relationship and a greater sense of belonging. Promotes lasting and trusting relationships between all involved. Emphasizes the importance of having local suppliers and labor to generate a lower impact and strengthen the local economy. 8. Maintain quality, aesthetics and care. Durable and aesthetic designs, quality before quantity. Brands can also offer repair services to help conserve products. It’s about understanding that we should invest more, in less clothing. A quality and timeless garment will last much longer, becoming a worthwhile investment. It is a aware consumption, based on human connections and with the environment, showing respect for them. I must also clarify, dear readers, that some say that if we talk about slow fashion, we are not talking about sustainable fashion, but a practice to give an extended use to clothing, however, many claim that we cannot separate the terms since this philosophy is the future of sustainable clothing. If we do not decrease the consumption of clothes, how can we induce any change? With this philosophy, (as the green life) we want to teach the population that materials do matter, and that it is necessary that our clothes be made with noble products with the environment and that they are biodegradable. The slow movement had its origin in food. In 1986 the Italian psychologist and activist Carlo Petrini organized a resistance against the fast food chain McDonald’s to prevent it from opening a branch in the Piazza Di Spagna in Rome, creating the movement of “Slow Food”. It was not until 2007 (21 years later) that the writer and sustainability professor at the University of Arts in London, Kate Fletcher, first used the term “Slow Fashion” at a conference, stating that: “Slow Fashion is not a seasonal trend that comes and goes like animal print, but a sustainable fashion movement that is gaining drive”. From there, the term began to be used until today. The movement took off in 2013, from then on it began to use the term in a serious way. That year a tragedy occurred, in a factory in Bangladesh died more than 1,100 people, when the building where they worked producing garments in an industrially collapsed. The place did not have the minimum security standards. Until today, this incident is considered as: “The biggest catastrophe in the textile sector”. This is how the philosophy of consuming less and better went from food to fashion. We not only must we take care of our interior, but also our exterior through a responsible and conscious consumption of our clothes. 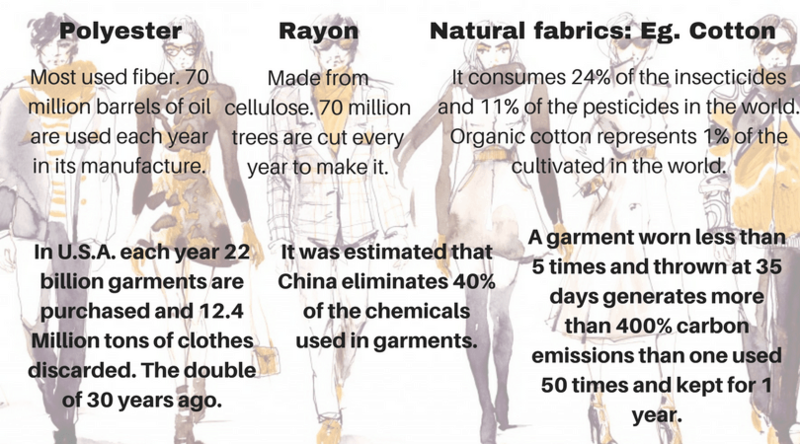 And if so… why are not we wearing sustainable clothing? Sustainable fashion, in the form of the slow movement, has encountered various obstacles, both by consumers and clothing manufacturers. The main one is that we are used to the cheap and disposable, and that is not yet seen as profitable. One of the attractive things about “fast fashion” is that it is affordable for consumers. In addition, it is easy to access it. Buying a garment that is eco-friendly is not always the easiest and the cost is higher. Sustainable fashion is affordable, what happens is that we are used to the prices of fast fashion, because, why buy something that seems so expensive, when you can buy something cheap, and replace it every year? – We’re used to that, right? It’s not about getting rid of all our wardrobe, it’s about understanding that we should invest more, in less clothes. We will even see that doing it that way we will be saving. Because, let’s be honest, most of us do not get to use everything in our wardrobe, there is always a shirt, a pair of pants, a skirt, a pair of shoes, whatever you want, we use constantly, and therefore, that every year we are replacing. When we realize, we have spent a lot more replacing a garment every year (or less), than if we had only made an investment in a quality and durable garment. Believe me, the impact on our pocket and the environment will be much less. The truth is that the more it is produced, the cheaper it is. Fast fashion is not only cheaper because it is produced with slave labor, but also because it is scalable. With sustainable fashion it happens that there is no scalability, production is very low, therefore, costs go up and that is why many companies are at the highest point in the price range. Everything is due to production. But if we are willing to buy more sustainable clothes, we will change the scheme, companies will see that they can make a profit and therefore will be inclined to invest in sustainable fashion. According to the writer of the book “Slower Style: The Amazing Future of Sustainable Fashion”, Allie Frownfelter, there are 5 mistakes that followers of sustainable fashion make. It is a common mistake to think that we are not “green” enough and therefore go out and buy more things or replace the ones we already have that apparently are not green. Instead, focus on what you have and go ahead with that, practice minimalism in your wardrobe. 2. Covering up your sustainable fashion mistakes by purchasing more unsustainable clothing. It is the opposite of the previous error. Many times guilt can make us believe that we are being extremists and that we are limiting ourselves to buying all those cute clothes that we do not need. It is necessary to have a balance and… forget about the credit card. We must understand that just because it says “ecological” does not mean “sustainable”. Take the time to research the products, have a solid style plan and stick to your fashion goals, do not follow trends, just because they are trends, and finally, do not forget to breathe. Let’s be honest, dear readers, the “green garbage” is still garbage! Keep in mind that what you are looking for is quality over quantity. If you need to buy something, you’re better off buying something of good quality and durable, and not only what can be a little better for the environment. It is necessary that you plan your wardrobe, as I said above, focus on minimalism, combine clothes that go with everything. Do not buy clothes that don’t go with the rest of your wardrobe. Think that, although it is ecological, what you are looking for is durability, so focus on it, and only change the clothes when they wear out. There is still a long way to go for brands to really engage in this movement, however, today we find brands of clothing, jewelry and shoes willing to be part of this new philosophy. Among them are: DKNY, Stella McCartney, Bottega Veneta, Balenciaga, Gucci, Conscious and Conscious Exclusive collections, H & M, Join Life, Zara, or Mango Committed, Pandora, Lemlem, Lia Terni, Stillsane, Re / Done, Noah , IAIOS, Olderbrother, Reformation, Veja, Patagonia, Amalena, Mara Hoffman, Armedangels, Edun, Hemper, Ecoalf. In addition, the hundreds of brands that make sustainable fashion handmade locally. On the other hand, the question arises: Why do not big brands incorporate this into their entire business model? Is sustainable fashion just a trend for them? Are they practicing greenwashes? If so, I’m afraid the change is not genuine. If we change trends over time, sustainable fashion has the opportunity to have a significan impact on the way we look and buy clothes. Your consumption can change the world. It is important to be aware of the power we have by putting pressure on companies to “transform the life cycle of the garment” into one that is respectful of the environment and society. Finally, Slow Fashion makes a call to the doors of your wardrobe, but first, it must occur in the mind. Mentalize yourself as a sustainable fashionista. If you want to be updated with more content like this, don’t forget to follow us on the Nammu Blog here. Also, we value your opinion, so take a moment to leave us a comment. Dear Nina, thanks a lot for your lovely comment! Best regards!